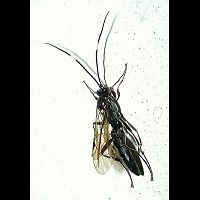 There are many species of parasitic wasps. So many that we don't have the faintest idea about the exact number. Anyway, in Holland alone there are some 1,500 species. 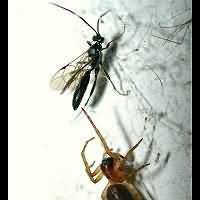 Parasitic wasps can be divided into two main groups. Gall Wasps, vegetarians laying their eggs in plants or leaves, causing among others the famous oak apples. And we have meateaters depositing their eggs in living animals, insect larvae mainly. Some of these wasps are quite big and striking, like the one on this page. It is even bigger than an ordinary wasp. 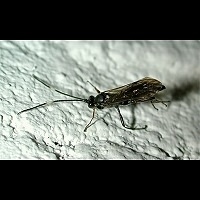 But most parasitic wasps are much, much smaller. As we said before there are many extremely small parasitic wasps. That is because many of them are parasites on other parasitic wasp larvae. Those we call superparasites. And believe it or not there are other, even smaller species that are parasitic to superparasites! Those we call hyperparasites. The species on this page has been identified by Kees Zwakhals, who is pretty sure, but too much of a scientist to be convinced, for we haven't caught the animal. Aoplus personatus is parasitic to caterpillars and seems to concentrate on the larvae of various whites. In the pictures it seems to be fighting with a spider, probably a House Spider (Amaurobius similis). In fact the two animals seemed to be interested in one another for a short time only.